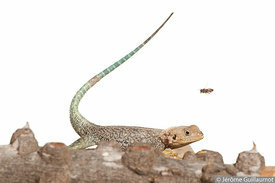 During my stay at Baringo, Kenya, in January 2014, for the African version of my "Voltige" series, I had the opportunity of observing a very interesting behaviour from The Common Agama (Agama agama) also named “Rainbow Lizard”. 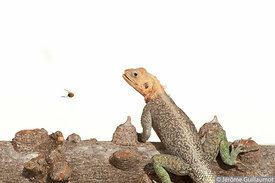 The Agama wandered on the bird feeder, attracted by fruits that were set for the birds but most of all he was attracted by all the insects flying above. What I was able to check and prove with my images is the ability of the Agama to change colours in a very short period of time. 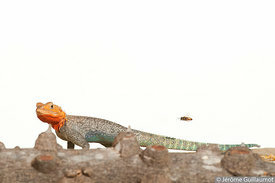 Photo #1 -15:31:41 : When it jumped on the feeder, the Agama showed bright colours specially a vivid orange on the head. Photo #3 -15:34:23 : Now, the colours of the Lizard are dull. The orange colour of the head has almost entirely vanished. In less than 3 minutes the colour shift is dramatical. This change is related to the Agama’s mood. When he jumped on the feeder, it shows the brilliant colours of a dominant male that claim control over a hunting territory (its sudden irruption on the feeder made a group of weavers fly away). Once he is positioned to chase insects, I suppose that his bright colours are a disadvantage and a camo pattern with dull colours is more appropriate for hunting. 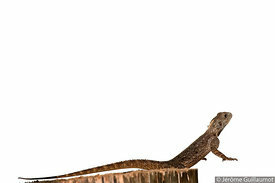 Photo #4 : This photo, which is taken the day after, shows the same Lizard with dark brown colours at the precise moment when he jumped to catch a fly. This shows that not only Chameleons can change colours.